I have been at too many funerals since Christmas. Ted says it’s because we are people of a certain age. Former Dundalk Sinn Féin Councillor Harry Todd, Arthur Mullen, Armagh City Sinn Féin activist Dympna McCague (Corrigan) and actor and trade union activist Jer O’Leary all passed. I never got to the funeral of David Cullinane’s mother Bernadette. Or H Block escapee Seamus McElwaine’s mother. And my friend Jane Crane didn’t have a funeral. Instead her ashes were scattered on Errigal. Great human beings all of them. I am blessed to have known them. My condolences and sympathies to all of their families. I was at Jer O’Leary’s funeral along with Mary Lou McDonald, Micheál Mac Donncha, Lucilita Breathnach and many others from Sinn Féin. There were other political activists, people from theatre and cinema, trade unionists, friends and neighbours. Jer’s coffin was draped in the Starry Plough and the procession included some of his finest trade union banners. I have known Jeremiah ‘Jer’ O’Leary for decades. He was a big man. Big in body. Big in spirit. Big in voice. 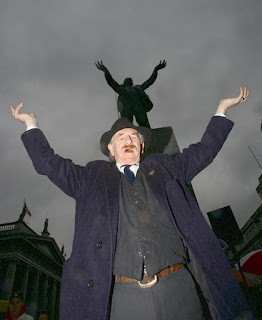 Most people have heard of Big Jim Larkin. His name is synonymous with that of James Connolly and the 1913 Dublin Lock-out. Jer’s performance as Larkin brought the character and strength and voice of Larkin alive to generations who never knew him. In countless pageants, Sinn Féin Ard Fheiseanna, community events and plays Jer revelled in the part of Larkin. With arms outstretched, head raised and voice booming he was the embodiment of Big Jim. Jer was a proud north-side Dubliner. He grew up in Drumcondra. According to his sister Margaret; “It was a great neighbourhood to grow up in, with dozens of local kids around our own age, and after school and during the holidays with everybody playing together on the local roads and on the railway line when we could get away with it. Football featured early in Jer’s life with daily battles on the road with teams from adjacent districts.” For years he supported Drumcondra FC but when that folded he began to support Bohemian FC which he continued to do until his death. Jer also supported Glasgow Celtic. In Dublin, and Belfast the weekend was also cinema time. TVs were a rare item in working class homes. Jer loved westerns and comics. He left school at 14 and by 16 was working in Birmingham helping to build the Bull Ring project. In the 1967 he joined the IRA. The story is told that he was one of the sentries for the IRA Army Convention which was held in December 1969 and which saw the IRA split into the Official and Provisional groups. Jer was an Official and had the dubious distinction of being the first person convicted in the South for IRA activity after 1969. He was imprisoned in Mountjoy. 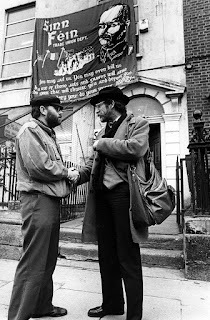 He later left the Officials and joined the Communist Party of Ireland but he remained friends with all of his former republican comrades from the 60’s. Jer was a strong trade unionist. He was a member of the ITGWU and later Equity and SIPTU Health. He took a particular interest in international struggles and was a prominent supporter of the campaign to end apartheid in South Africa. As a trade unionist he put the artistic skills he honed in Mountjoy Prison to great use designing and making banners for trade unions. He was always proud when he saw his banners on protest marches and demonstrations. 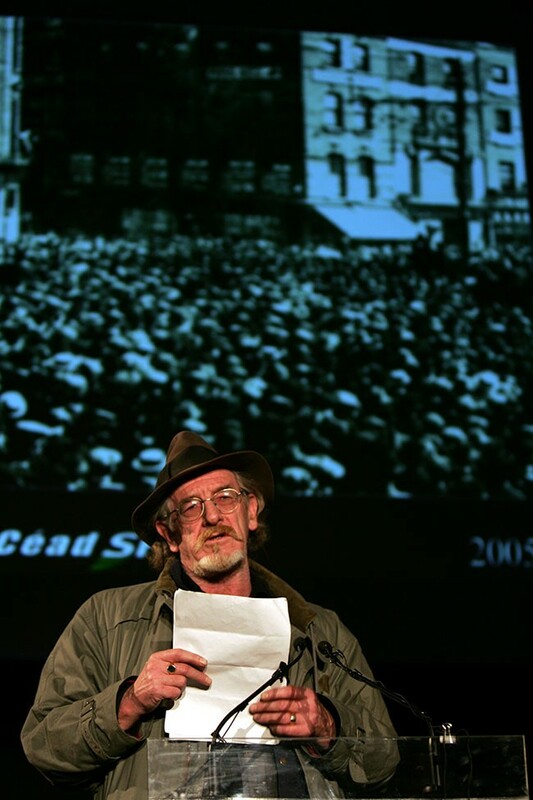 It was in 1975 in the Non-Stop Connolly Show in Liberty Hall that Jer first played the role of Big Jim Larkin. Later he attracted wider public attention when he took part in Peter and Jim Sheridan’s production of James Plunkett’s The Risen People. His radical republican politics were always very close to his heart. So close that on one memorable occasion at the end of the performance of The Marat Sade – a Marxist view of the French Revolution – in an unrehearsed speech to the packed audience he proclaimed that the men imprisoned for the Sallins’ train robbery were innocent. Jer had parts in 42 films, including Braveheart, My Left Foot, In the Name of the Father, Michael Collins, and the Field. He also acted in Game of Thrones. But it as Big Jim Larkin that he will be most fondly remembered. Jer O’Learly understood the power of language, of words. And he could deliver a speech like no other. At a Sinn Féin event in the Mansion House he was Big Jim Larkin. In Glasnevin Cemetery in 2017 he read the 1916 Proclamation. 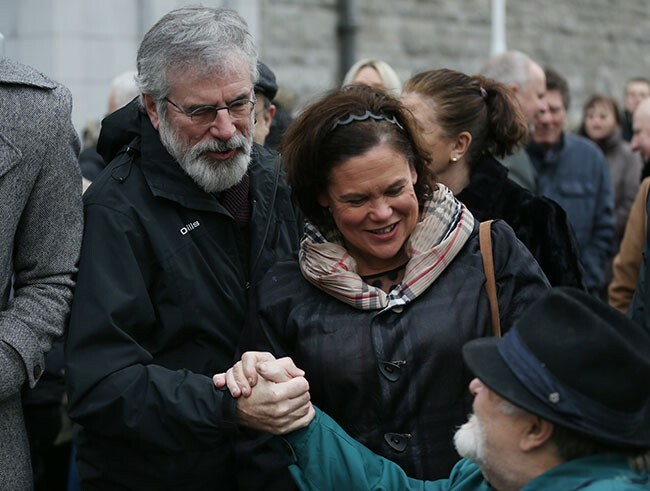 Over the years he has spoken at countless republican events often as Larkin, sometimes as himself and occasionally as James Connolly delivering his final statement to the Court Martial. In 1998 the Sinn Féin Ard Fheis celebrated the 200th anniversary of the United Irish Society. Jer was Wolfe Tone. He was accompanied by a group of pike men and women, including his son Diarmuid. 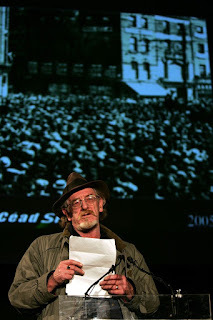 Later that year Diarmuid died in a fire in Glasgow. Jer and Diarmuid had separately travelled to Glasgow for a Celtic match and bumped into each other briefly afterward. Diarmuid died later that day in a fire. It was a terrible loss for Jer, and the rest of the family. Subsequently Jer’s partner Eithne died in December 2017. It was a loss he never properly recovered from. "The great are not great. The great only appear great because we are on our knees. Let us arise!" Ní bheidh a leithéid arís ann agus mar a dúirt Jer féin go minic 'An Phoblacht abú.'"